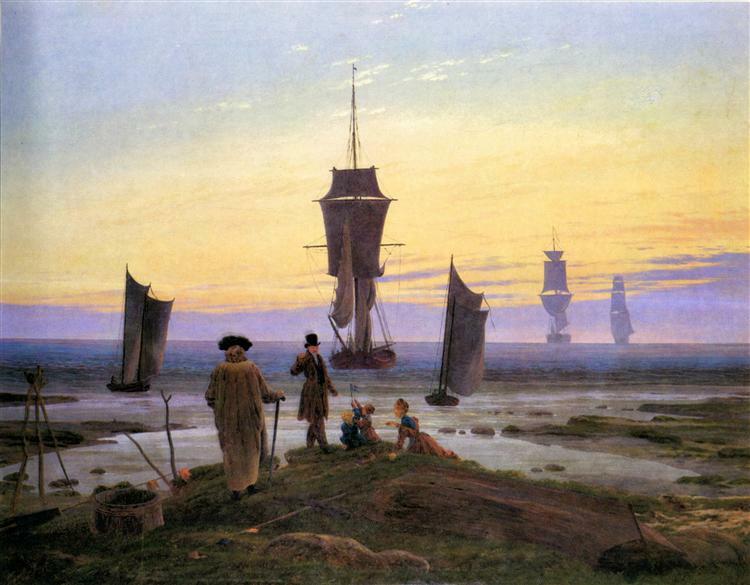 This is the third version of one of Friedrich's most famous paintings, of which the first (1819) is in the Gemäldegalerie, Dresden, and the second (ca. 1824) is in the Alte Nationalgalerie, Berlin. The two men contemplating the sinking moon have been identified as Friedrich himself, on the right, and his talented young colleague August Heinrich (1794–1822). The mood of pious contemplation relates to fascination with the moon as expressed in contemporary poetry, literature, philosophy, and music. Both figures are seen from the back so that the viewer can participate in their communion with nature, which the Romantics saw as a manifestation of the Sublime. 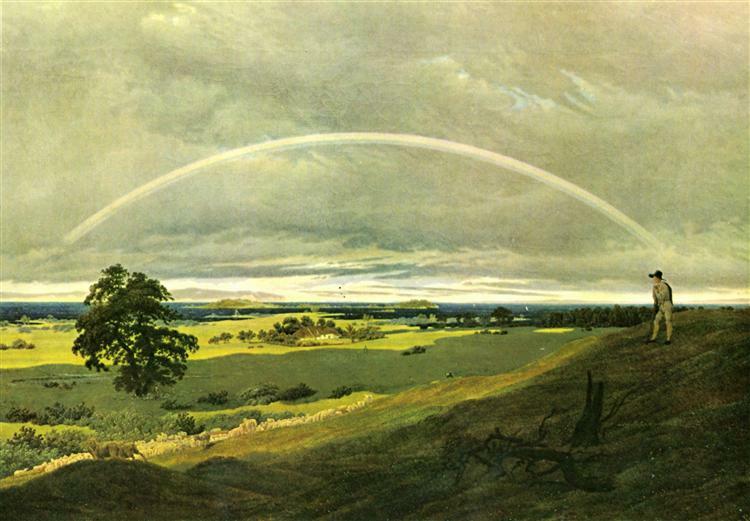 Although the landscape is imaginary, it is based on studies after nature that Friedrich had made in various regions at different times. Both men wear Old German dress, which had been adopted in 1815 by radical students as an expression of opposition to the ultraconservative policies then being enforced in the wake of the Napoleonic Wars. The staunchly patriotic Friedrich deliberately ignored the 1819 royal decree forbidding this practice and depicted figures in traditional costume until his death. 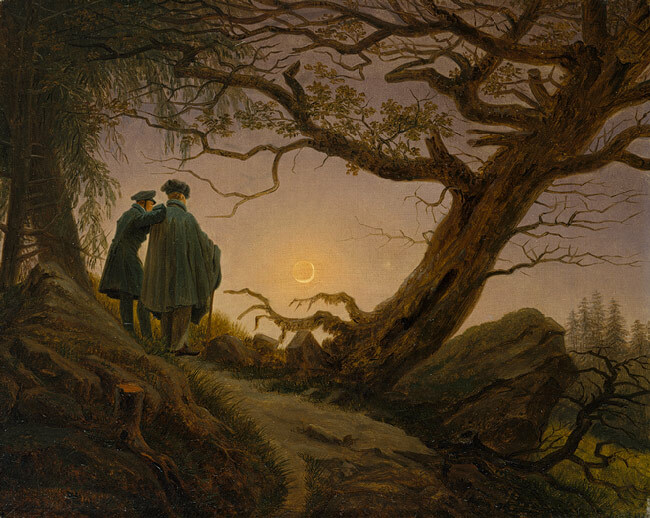 Two Men Contemplating the Moon (German: Zwei Männer in Betrachtung des Mondes) and Man and Woman Contemplating the Moon are a series of similar paintings by Caspar David Friedrich, the setting being among his best-known works. Friedrich painted at least three versions, with one variation featuring a man and a woman. The 1819–20 version in the Galerie Neue Meister is thought to be the original; the c. 1824 variant with a woman is in the Alte Nationalgalerie; and the c. 1830 version is in the Metropolitan Museum of Art. These German Romantic landscape paintings feature two figures in a dark forest silhouetted by a pastel sky. The works' dark foregrounds and lighter backgrounds create a sharp contrast. The sky suggests that the time is around dusk, with the waxing crescent moon close to setting. A dead, uprooted tree's dark roots and branches contrast with the sky. The jagged branches and stark contrasts seem to create a threatening environment for the figures, and are reminiscent of the imposing Gothic style seen originally in the medieval era, but revived in the Romantic era. The same can be said of the dark, shadowy trees and rocks surrounding the couple. The figures themselves are dressed in dark colors and stiff, somewhat formal garments, which also serve to signify their higher class. 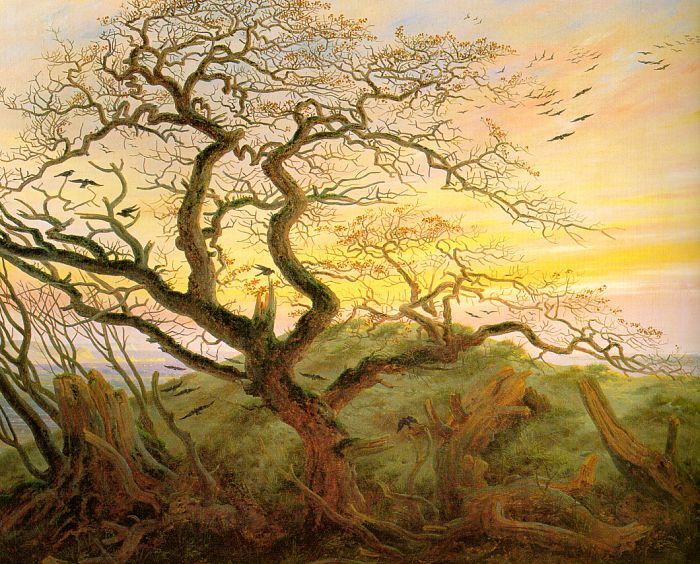 The works emphasize spirituality in nature and the presence of the sublime, which are major themes of Friedrich. Playwright Samuel Beckett, standing before Man and Woman Contemplating the Moon, said "This was the source of Waiting for Godot, you know." The paintings depicts a foreground scene of two people on a mountain path, which leads up from the centre bottom of the picture to the left. The man on the right is wearing a grey-green cape and the black beret of the altdeutsche Tracht and has a stick in his right hand. The man on the left is somewhat higher on the path and is leaning on his companion's shoulder; he is slimmer and is wearing a grey-green frock-coat, from which a white collar protrudes, and the black cap of an early Burschenschaft, its ribbon tied under his chin. They are both looking at the sickle of the waxing moon and the evening star. The moon's night side is lit by earthshine. The scene is framed by an uprooted and moss-grown oak on their right, whose branches reach out to those of a spruce on their left; a boulder prevents the oak from falling, and there is another boulder on the left. In the background the landscape falls away; the tops of pine trees suggest a forest. In the immediate foreground are a tree stump and a large dry branch lying on the ground. The painting is almost monochromatic in shades of brown and grey, depicting nightfall. The Dresden version is generally held to be the original, because it most perfectly exemplifies the golden section in the ratios between the central vertical axis, the perpendicular axis between it and the star, and the other axis running through the older man's eye. The German art historian Werner Busch sees the geometric layout as signalling the transcendent message of the two figures' experience of nature. As in many paintings by Friedrich, there is no middle ground; the foreground earthly scene is contrasted with the lighted sky and the abyss at the two men's feet made perceptible through this contrast, which exemplifies the antithetical relationship of rational, palpable earthly space and irrational and sublime infinity explored by the Romantic painters. The composition places these in a harmonious relationship. 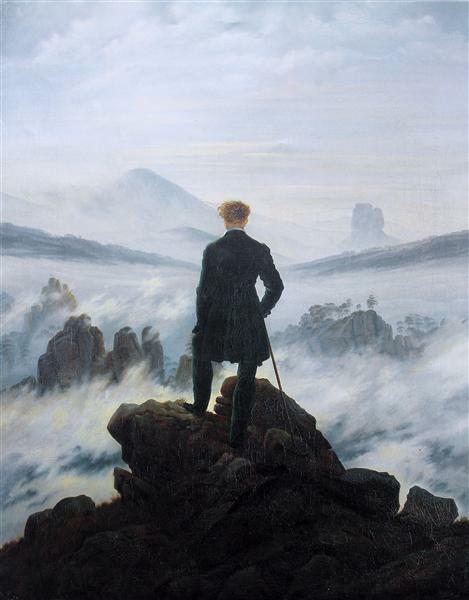 It has been described as a defining image of German Romanticism.